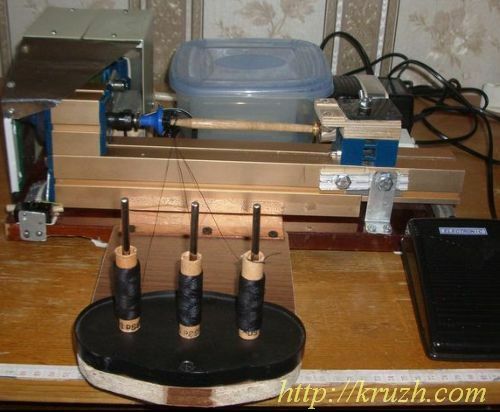 – motor power, that is enough to lay thread coils tightly. Canadian bobbin winder (see Fig.4.4 above) is the nearest to our ideal. You can notice in the photo that movable center takes only three discrete positions. It is difficult to understand whether motor power is sufficient. We tried to find out our way to an ideal bobbin winder. The first demand is satisfied in winders, in which a bobbin is squeezed between two centers, and a distance between the centers is regulated in large scale. The second demand implies using electric engine to rotate a bobbin. Special means are necessary to realize the 3rd, the 4th and 5th demands. It is known that lathes are having all mentioned attributes during the last 120 years. So the ideal winder is to inherit the best functions of modern lathe, and there is nothing to invent. The problem is how to construct an ideal winder at home if you have no special equipment and materials to make it. According to chosen conception authors worked out typical amateur construction assembled out of ready units adopted from the very unexpected sources and from home-made units as well (Fig.4.13). – power supply unit with connectors. We have not got a long machine bed, so we have to join the short one together with long slide to enlarge general length of the machine bed to 360 mm (14.2 inches). Due to that transformation it became possible to wind any bobbins – both short bobbins (used in West Europe, less then 100 mm, or 4 inches) and long Russian bobbins (130 to 200 mm, or 8 inches). The bobbin head rests against a plastic cup adopted from a toy. Such a cup can be adopted from furniture (i.e. door knob handle).The cup is put on the metallic axe. The right half of the axe has carving M4, the left half is smooth. The cup is fastened to the axe with the female screw. Thin soft rubber disc is glued into the cup to prevent slipping the bobbin head in the cup when a thread is stretched. The bobbin tale rests against the right cup tied together with the inner ring of the ball-bearing. The external ring of the ball-bearing is tied together with upper piece of the carriage. The lower piece of the carriage slides along the engine bed. This detail is mentioned as an intermediate piece in the Xendol lathe. The hole is drilled through the both pieces, and the screw-bolt is nested into it. The bolt head is filed around in so manner to fit with the slot of the engine bed. Two short tubes are pressed into the button slots of the lower piece to prevent rotating of the carriage around the vertical screw-bolt. The wing-nut of the bolt clasps the carriage to the engine bed and fixes it in the position according the bobbin length. When the wing-nut is relaxed, the carriage can slip along the bed. It is recommended to lubricate with some thick oil the work part of the bed slot where the bolt head moves. It would be better to move the carriage along the bed with a screw transmission. There is such transmission it the Xendoll lathe but its screw belt is too short (70 mm, or 2.7 inches). 1. The bobbin tale rests against the sharp cone that damages the bobbin. 2. The live center is fixed on the engine bed surface with a screw that is controlled with a special screw-driver, but this method is not admissible in an ideal winder. In all known mechanical winders one is to raise rotation speed from manual driver wheel to a bobbin rotation axe at 4 to 8 times. The opposite problem arises when an electric motor is used as a driver. The matter is all small electric engine work effectively only at high speed (thousands revolves per minute). Hence the speed is to be lowered at dozens times to drive a bobbin. It can be made with reducers (see the paragraph 3.5). We managed to find only two examples of electrified winders in the Internet. One of them is shown at Fig.4.4. It is difficult to understand viewing photos how reducers are made but there is no doubt – reducers are used. If not, bobbins would be rotated so quick that it would not be possible to stop winding in proper time interval (less then 1 second). In the Xendoll lathe one can to reduce gyration rate at 9 times using two stage belt reducers. However it is necessary for winding to lower angle speed at 36 to 42 times. So authors had to create own reducer with two stages as well. The first stage is a friction pair with reduction rate 1:10 and the second stage is a belt wheel transmission that has reduction rate 1:4. 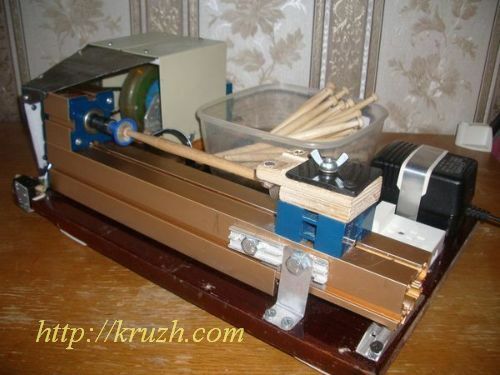 As a result bobbin gyration rate is 40 times less then speed of the motor roller. To our regret sizes of the reducer are too big. We had to use only ready accessible wheel pairs. There are possibilities to make the reducer more compact. 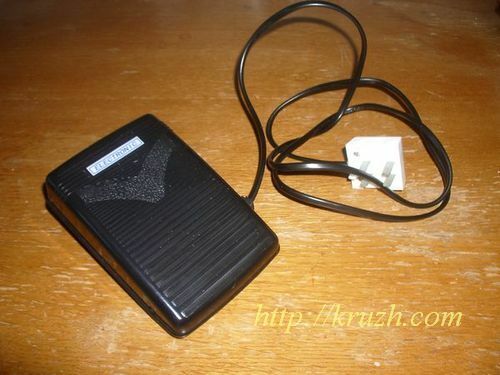 The power supply unit input is alternate voltage (220/230 V, 50 Hz). The adaptor gives direct current into the motor (12 V, maximum 2000 mA). One can change direction of bobbin rotation clockwise or anti-clockwise switching voltage polarity at the motor input using the first connector. It is important for a lace-maker to wind the bobbin using both hands. It means she needs a pedal to control the motor. Such a pedal is adopted from a sewing machine driver (Fig.4.21). There is a key in the pedal box. When the pedal is pressed, the motor is powered and the bobbins rotates. When the pedal is relaxed, the motor and the bobbin are stopped. The cable of the pedal box is joined to the adaptor with the second connector. Sometimes the manual controlling can be useful too. For that case the second key is set under left hand. This key doubles the key in the pedal box. 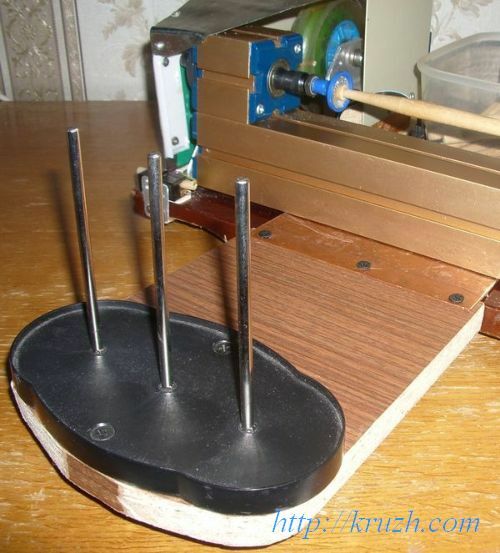 – the plastic box for keeping the pedal (it is convenient to keep empty bobbins as well). The second platform is joined to the fist one (Fig. 4.15, Fig. 4.17). Three dowels are set on it to nest standard spool. These are sources of thread for bobbins. The second platform has a metallic front plate that is inserted into the slot between the engine bed and the first platform. The contrivance makes it possible to wind threefold thread as is demanded in some plating technique. One has to pull the thread stronger, and power 20 Watt does not seem to be in plenty for the motor. All known electric bobbin winders (as one can see at photos) have micro engines with power 1 to 2 Watt. Of course these are very compact but a bobbin winder with such motors deliver weak tension of thread. Setting the bobbin to be winded takes several seconds and it is fulfilled without any instrument. The winding process duration depends on quantity of thread layers and takes several seconds in any way. There are all reasons to consider new winder as universal one since it is completely indifferent to sizes and forms of bobbins, used both in all regions of Russia and abroad.